Berlin Jewish community gathers in memory of terror victims and to pray for the recovery of the wounded. 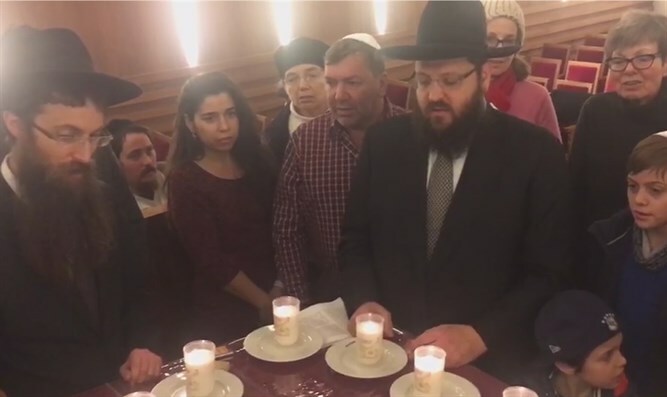 Rabbi Yehuda Teichtal, the Rabbi of the Berlin Jewish community, presided over a memorial ceremony dedicated to victims of Monday's terrorist attack at a Berlin Christmas market and to praying for the quick recovery of the wounded in the attack. About 100 members of the community attended the memorial. "We are here together today. The terrorists did not distinguish between us." Rabbi Teichtal said. "They did not do this only against Berlin, or against Germany, or against the Jews. They did it against every person who wants to live a life of democracy, a life of mutual respect, and a life of light. Our answer to that is the unity and solidarity we see here." he continued. Klaus Dieter Groll, a member of the German Parliament, the Bundestag, and a member of German Chancellor Angela Merkel's Christian Democratic Union of Germany (CDU), also attended the ceremony. Groll spoke of how he had participated in a number of Jewish ceremonies in the past and how he had seen the increasing security that is necessary to protect Jewish establishments. He said that he hoped that there would soon be no need for such security. The fact that all of Berlin now lives under heightened security is very sad, he added. He said that the answer to the terrorism which caused the heightened security is the continued existence of life. Groll also declared his intention to attend the traditional lighting of Hanukkah candles at Berlin's Brandenburg Gate next week. At the ceremony, the community members recited Psalms for the wounded and lit 12 candles in memory of those who were slain during the attack. At the end of the ceremony, the community members sang the Jewish prayer "Oseh shalom bimromav" (He who makes peace in the heavens) in the hope that peace would return to Germany and to the world.